Are you ready for another Danglefoot Once Upon A Time duo? I've spent the day watching OUAT so I definitely am! This duo is based off the two witch sisters, Regina and Zelena. Technically that's a bit of a huge spoiler if you haven't seen the show so I'm sorry! The fact that they're in a duo together suggests they're pretty connected though right so it's not all my fault... Hayley has absolutely smashed it with these beauties, they're incredible! Let's take a look at them shall we? 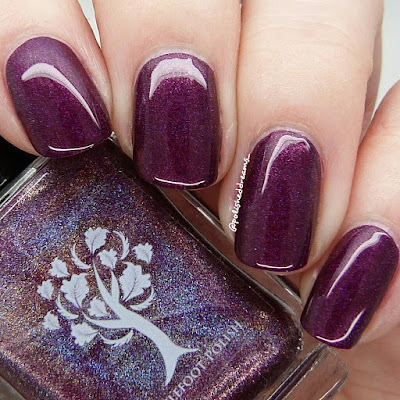 Regina is an absolutely stunning burgundy/purple linear holo. To me this is totally perfect for Regina as it reminds me of her outfit choices and the purple smoke that appears when she magics herself anywhere. When I showed my mum and said it was named after Regina she was like "Oh, like her Evil Queen dresses she wears?" so obviously that's just further proof Hayley has nailed the polish shade! As usual, this had a silky smooth formula making application a breeze. I've definitely come to really love Regina in OUAT recently and this polish is no exception to my Regina affection! Shown here is two coats with topcoat. In the show, Zelena turned bright green out of envy for Regina and everything that she had. 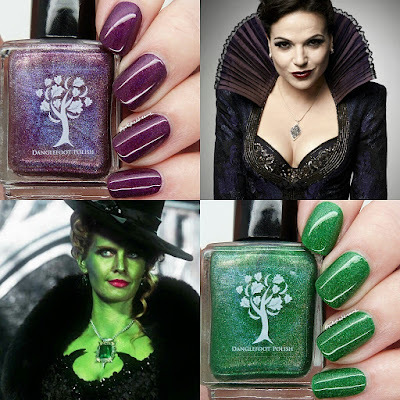 This of course meant Zelena's polish had to be bright green and boy am I glad! 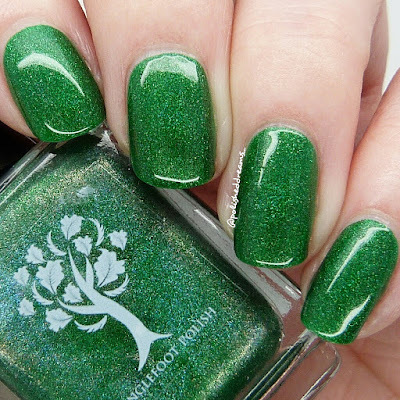 This is seriously the most stunning green polish I have ever seen, no contest here. I know you probably think I'm biased towards Hayley and her polishes (which is probably true!) but I am absolutely speaking the truth. It's just so bright and smooth and sparkly...wow. Pictured here is two coats and topcoat. Well I think I can say for sure that this is my favourite OUAT so far. Hayley is really pulling out all the stops before she goes on maternity leave in a couple of months! I'm loving the polishes but I'm not sure my poor bank account can cope. Regina & Zelena are not currently available however, they will be returning at some point so keep your eyes peeled! As I said on Wednesday in my Rumple and Belle post, the next duo called Henry and Violet has been released and you can buy that here. Not only is there a duo but a single polish has been released which also looks amazing! This is called The Dark Curse after the spell that started the story off and is currently sold out but will be back. With Hayley going on maternity leave soon, you'll definitely want to be stocking up on Danglie's while you can! I watched this show for a while but then fell out of love for it. However I have loads of love for that green, it's amazing!! Gorgeous swatches.